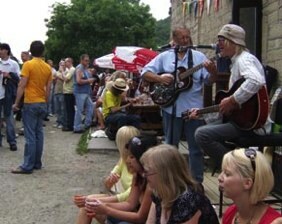 A really relaxed Northern cider festival takes place in July when the Stubbing Wharf hosts its 4th Cider Festival, from 2nd to 4th July 2010. The annual Cider Festival has become a growing success year on year, well-known for showcasing one of the largest selections of ciders and perries in the north of England. This year, the pub has decided to add an extra day to the event and the Festival will be running for a full three days, from Friday to Sunday, with attractions for dedicated enthusiasts, CAMRA members and families too. As well as a range of over 70 different ciders from producers across the length and breadth of the UK and beyond; there will be canal boat cruises, live music from some popular local turns, a magician and children’s entertainment. There’s free admission too, with 10% discount on Festival Ciders for CAMRA card-carrying members on the Friday. Saturday includes a hog roast and live entertainment too. Sunday will be a more family-orientated day. 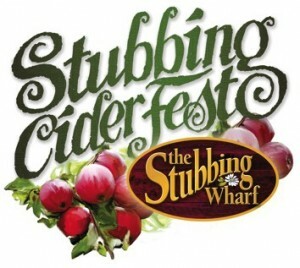 As well as cider, a delicious array of apple juices will be served up with attractions including the Stubbing’s ‘Magician Laureate’ and live entertainment including the Ryburne Longsword Dancers. Boat trips will be running up and down the canal all weekend. Coupled with the Stubbing Wharf’s great reputation for its food locally and the canal boat cruises there is plenty to make it a great day out. The Stubbing Wharf is a pleasant walk from Hebden Bridge along the Rochdale Canal towpath, for visitors arriving by rail, or for designated drivers, there’s ample parking and a plentiful choice of apple juices too. 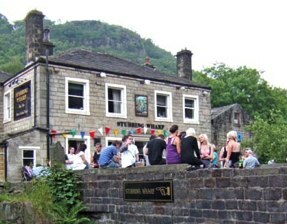 The pub is situated on bus routes (details below), accessible on foot from Hebden Bridge. You can of course arrive by boat using the canal; indeed the Stubbing Wharf Cruises will be providing canal boat cruising during the Festival. The Stubbing Wharf is located off the A646 on the west side of Hebden Bridge, sandwiched between the River Calder and the Rochdale Canal. If you are in the car, there is ample parking (although this may become limited as the Festival becomes busy). Or if you are on the bus, numbers 590 592 594 stop close by. By train or by foot, The Stubbing Wharf is a short walk along the canal towpath after lock 11.